Symptoms and signs vary according to etiology. 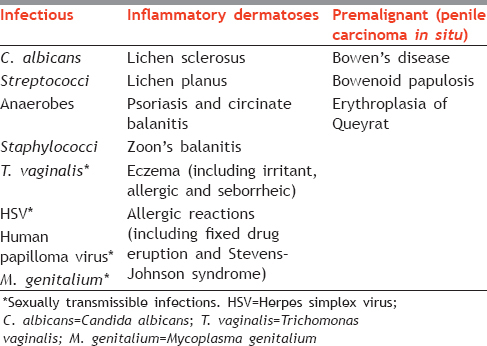 Descriptions of the typical appearances of infective balanitides are discussed in detail [Table 2]. Balanitis is a descriptive term covering a variety of unrelated conditions, the appearances of which maybe suggestive, but should never be thought to be pathognomonic, and biopsy is sometimes needed to exclude premalignant disease. To diagnose and treat sexually transmitted disease. HIV should be ruled out in every case not responding to therapy/having atypical presentation. Edwards S, Bunker C, Ziller F, van der Meijden WI. 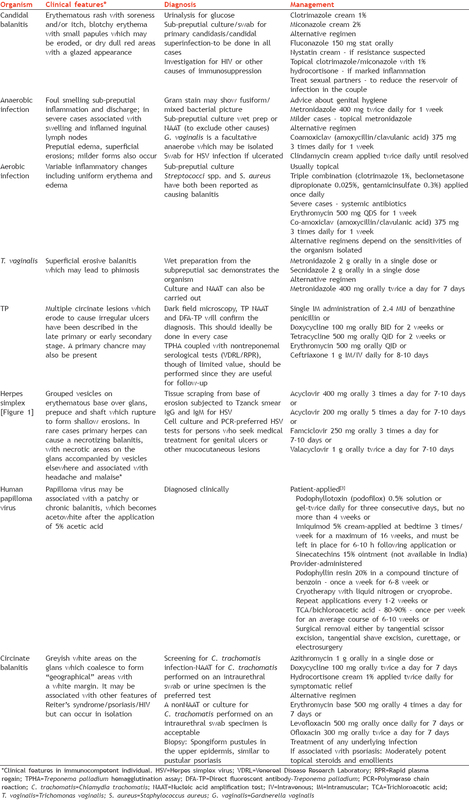 2013 European guideline for the management of balanoposthitis. Int J STD AIDS 2014;25:615-26. Yanofsky VR, Linkner RV, Pompei D, Goldenberg G. Current update on the treatment of genital warts. Expert Rev Dermatol 2013;8:321-32.